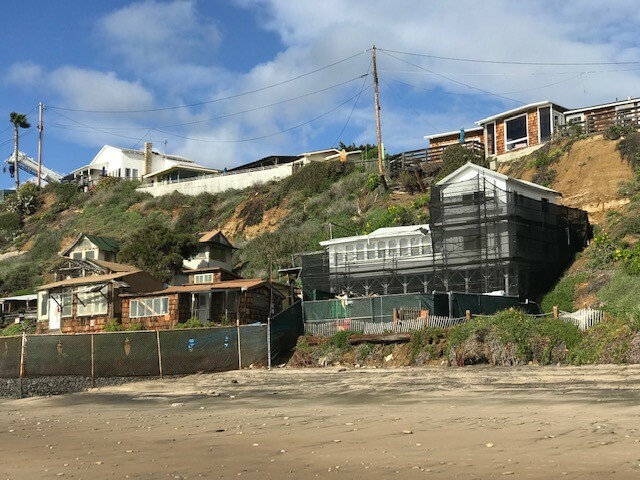 Despite the heavy downpours of rain in January and February, work on the north beach cottages continues to stay on track. Our two construction companies, RockForce and Spectra have been working diligently stabilizing the north beach road in preparation for heavy machinery to maneuver down closer to the cottages. You may notice that a few of the cottages have been “scrubbed” and white washed, this is to ensure all lead paint and asbestos is removed for the safety of the workers and future cottage guests. From the sand you can see colored tags on the cottages’ walls, windows, doors and other surfaces indicating information on the historic value, current state and future use. This prepares the cottages for disassembly, which has already begun on Cottage #12. Two others will be disassembled during the infrastructure construction. Disassembly of these three cottages is required in order to provide access to construct the retaining walls behind them. Major deliveries to the site occur in the morning hours, so if you are walking or running, please be mindful of the pedestrian walkways and our traffic monitors John and Robert. They are there for your safety so please say hello and follow their instructions. Construction hours are from 8 a.m. to 4:30 p.m. only. Minimal equipment will be moving or present in the Historic District’s hollow; however, during the slower months, there will be work completed before the crowds of summer. You may be wondering about the Beachcomber’s Express Stand on the Promenade. Not to worry, it has moved just a few feet to the south and will be in full service by the summertime and its normal operation days and hours. Thanks for staying updated and remember the construction site is a hard hat only area and closed for your safety.